How many pallets fit in a container? Vast majority of foreign trade transactions are completed via sea shipments and 90% of sea transportation is carried out with containerized shipments in today's global economy. As a result knowing how many pallets could fit in a container is a critical piece of information that every exporter and importer should be familiar with. Actually there are several pallet types available on the market. Euro pallets, industrial pallets and asia pallets are the most common pallet types that is in circulation. In addition to pallet types, there are more than a dozen of container types and sizes in use in international logistics. The combination of different pallets and containers makes it harder to create a simple list of pallet amounts per container. Right! 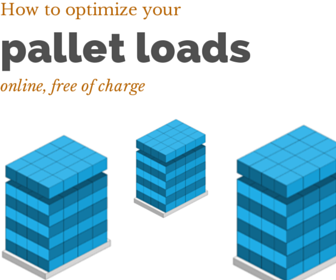 On this page you can find various examples of pallet loading amounts for different container types. EURO pallet or eur-pallet is one of the most frequently prefered pallet type which is available in international sea and multimodal transportation. The internal dimensions of a 40ft container are 2352mm width and 12032mm length. You can fit maximum 25 pcs of euro pallets in to a 40 ft regular container in couple of different container loading plans. 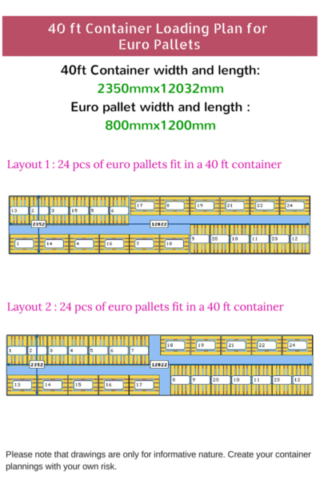 If you want to learn more about 40Ft container loading plans for euro pallets, please follow this link. How many Euro Pallets fit in a 20 FT container? 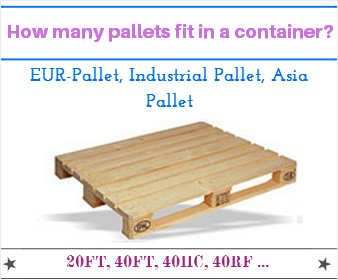 The dimensions of a EURO pallet are 800mm width and 1200mm length. The internal dimensions of a 20ft container are 2350mm width and 5900mm length. You can fit maximum 11 pcs of EUR pallets in to a 20ft container in couple of different container loading plans. 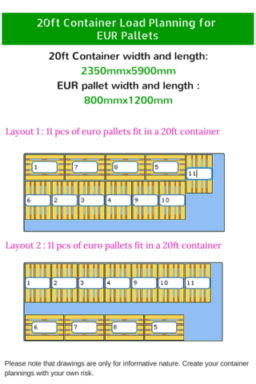 If you want to learn more about 20Ft container loading plans for euro pallets, please follow this link. How many Euro Pallets fit in a truck? 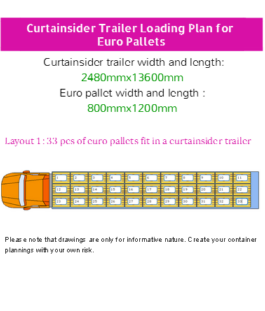 You can fit maximum 33 pcs of EURO pallets in to a curtainsider trailer in single loading plan. If you want to learn more about truck loading plans for euro pallets, please follow this link. How many standard pallets fit in a 40 FT container? Standard pallets are mainly used by US and Canadian companies, for this reason standard pallets are also known as North American Pallets. Another name of the standard pallet is industrial pallet. The dimensions of a standard pallet are 1000mm width and 1200mm length. If you want to learn more about 40Ft container loading plans for standard pallets, please follow this link. How many standard pallets fit in a 20 FT container? 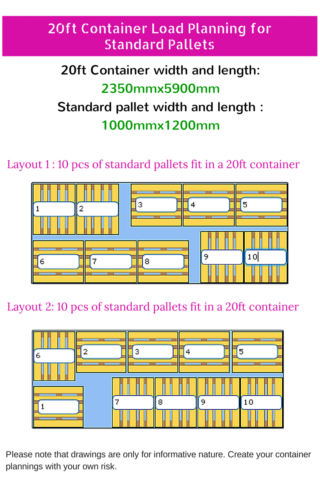 You can fit maximum 10 pcs of standard pallets in to a 20ft container in couple of different container loading plans. If you want to learn more about 20Ft container loading plans for standard pallets, please follow this link. How many standard pallets fit in a truck? Trailers are one of the key elements of not only land transportation but also multimodal transportation that covers a significant amount of land transport. In some cases trailers are also called as semi-trailers or TIRs. You can fit maximum 26 pcs of standard pallets in to a curtainsider trailer in single loading plan. If you want to learn more about truck loading plans for standard pallets, please follow this link. What are the differences between FOB and CFR? What are the differences between CIF and FOB? How to create an export packing list?